New York Mets left fielder Yoenis Cespedes has been placed on the 10-day disabled list, retroactive to Monday, with a strained right hip flexor. 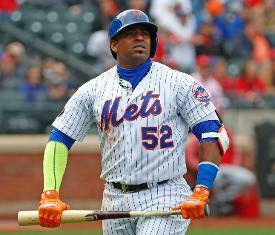 Originally injured on May 6, Cespedes played through the injury until an MRI exam on Tuesday showed the full damage. Cespedes, 32, was slated to be in Tuesday's starting lineup against the Toronto Blue Jays but was scratched after the team received the exam results. The Mets had him undergo the MRI as a precaution. Manager Mickey Callaway said he would only use Cespedes as a pinch hitter on Tuesday if the game was on the line. The Mets won 12-2, allowing the team to make the DL stint retroactive and hopefully get Cespedes back by May 24. Cespedes is batting .255 and leads the Mets with eight homers and 28 RBIs. He went 5-for-15 after the injury. The Mets called up utility player Phillip Evans from Triple-A Las Vegas to fill the roster hole.